a difference in their local communities. opportunity to advance in the competition and win additional prizes. state winners, and then 10 will advance as national finalists. of judges in New York City in early 2017.
choice winner will be selected in the spring of 2017. 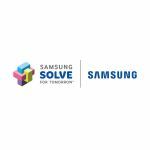 For a full list of State Finalist schools, please visit: www.samsung.com/solve.